Newton Aycliffe 1st XI v Marske 2nd XI – weather was mild and breezy. Newton Aycliffe won the toss and chose to bat first. 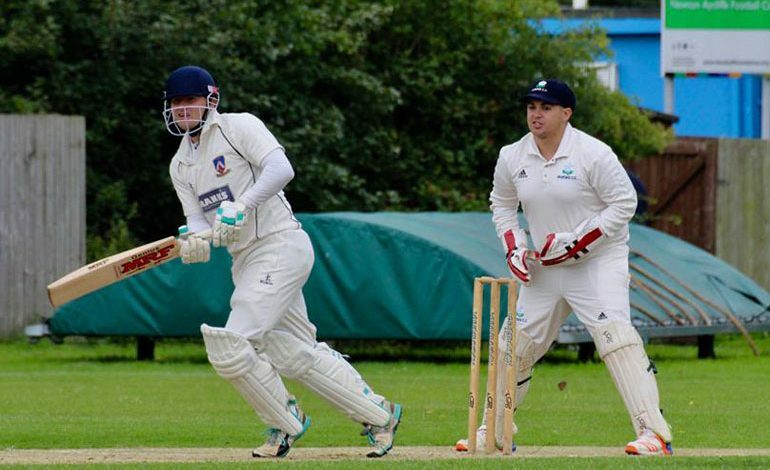 Newton Aycliffe’s 1st team won their fourth consecutive game with a massive 128-run victory at home to Marske 2nd XI. Adam Gittins (sponsored by Pheonix Energy, pictured in action above) was given the man-of-the-match award after he ground out 61 runs from a marathon 139 balls faced to help cement the Aycliffe innings together. Special mention must also go to opening bowler Jack Slatcher another outstanding performance with the ball during which he took five wickets for 34 runs from his lengthy 13 over spell when the visitors batted. The win maintains Aycliffe’s outside chance of promotion and they remain in third place, still 21 points behind 2nd place Middlesbrough in the second division table, with just four games to left to play this season.